MAX ZORN – RED, This might sound like the title of a movie and the chances are big that there will be a movie, but that’s not what this topic is about right now. Amsterdam has a new bright upcoming star as it comes to Art, Let’s call it the 2K Dutch masters. The works that Max Zorn presents takes the view of using everyday materials to a whole different level. 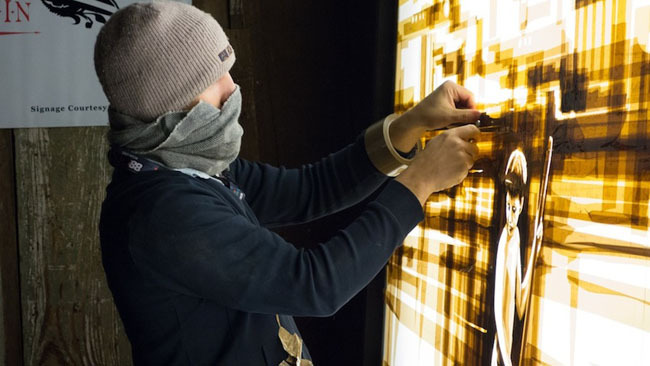 Just by using brown packaging tape, a scalpel, light and a whole lot of creativity he creates gorgeous artworks. JUST BY USING PACKAGING TAPE????? From 31st Januari this Saturday 17:00 the works of Max Zorn will be on expo at the Original Dampkring Gallery, a brand new art gallery on the singel canal (check links for detailed info) and I am as proud Amsterdammer looking forward to the stuff he is bringing.